A typical element in horror/thriller movies to build up suspense. A character is in a room, we hear somebody (or something) approach on the outside. The music swells. The camera pans in on the door knob/handle, which slowly starts to move. Often there is a Reaction Shot of the character's face filled with horror. The scene can take several directions from here, for example in the form of a Cat Scare, where the person entering turns out to be a harmless visitor. Monsters, Inc.: Sulley has accidentally let a little girl (whom he later calls Boo) into the monster world, which is forbidden. After managing to capture her, he goes back to her door to send her back, and as he reaches for the knob it suddenly starts to turn. The next shot is of Sulley's rival, Randall, coming out of the door. He deactivates the door, and as it is lifted up to be stored away, it leaves Sulley, who had been hiding behind the door, exposed. Thankfully, Randall never looks back. When Fidget in The Great Mouse Detective breaks into Flavisham's Toy Shop with the intention of abducting the owner, he spends several seconds rattling the door handle (which turns out to be futile) before breaking the window and entering with a Jump Scare. An early example can be found in the horror movie Vampyr (1932). The hero is woken from his sleep by a loud and slow knocking on the door. He turns and sees how the key in the keyhole slowly twists around. The door opens and an old and confused man stands in his room. In the horror movie Night of the Living Dead (1968), the female lead is sitting in the living room almost halfway into the movie while another character boards up the windows without her. She listens to the radio about the flesh eaters roaming outside in the night. The radio almost increases in volume with no other sound in the scene. She then hears a couple bangs behind the unchecked door beside her. The camera goes back and fourth onto the door and then on her face. The knob doesn't turn, and then the music soars as the other survivors of the house stumble out at her as she screams and tries to run away. Subverted during the climax of Night of the Creeps, zombies surround the outside of the sorority house of girls. Detective Ray Cameron yells for one of the girls to lock those double back doors. She then looks at the doors and the camera goes back into a long view shot as she focuses at it already frightened. Already having two scary incidents earlier in the movie with the same doors. The music goes quiet and she slowly approaches the door. The knob doesn't turn from the outside, as she reaches down to lock it with the key already inside. And then the music soars out as a zombie's hand crashes in through the glass of the door grabbing her wrist. In The Lost Boys, we see Sam taking a bubble bath when his brother Michael slowly comes walking up the stairs. Sam sings to himself completely clueless, but his dog Nanook next to the bathtub hears his brothers footsteps coming up on the other side of the bathroom door. The music doesn't go silent but in fact increases with the tension. Finally Michael stands outside the bathroom door, banging it, turning the knob with the camera focusing in. His brother Sam is now submerged under the water as Michael's confronted by a growling and snarling Nanook. Who then attacks Michael out the door, down the stairs, with the door slamming shut. In Coherence, the heroine supposedly kills her other self and placed her in the shower. Next morning, she walks by the bathroom when suddenly the door knob is tried a few times from the inside. Oh, Crap!. Then the door opens and another visitor of the house is exiting the bathroom. In Blood Simple., the camera zooms in on the door handle when the Psycho for Hire villain approaches Abby's apartment door. In Uncle Buck, the title character finds out his niece has snuck out to a party and goes after her. We see her boyfriend making out with someone in a room when the door handle jiggles. But the door is locked and the two continue. Then a power drill comes through the handle and the door opens to reveal Buck. But the girl is not the niece. In Zathura, the kids are hiding in a cupboard. They hear heavy footsteps outside. The camera closeups on the door handle, which starts to turn... and then the somewhat goofy astronaut comes back in. In Bound, Micky uses a Hairpin Lockpick to open the apartment door from the outside while Caesar and Violet are distracted inside. There are several close-ups on the door handle and how Micky finally succeeds to unbolt it. This was done with a side of Tempting Fate in Jurassic Park. After being chased through the facility by a group of raptors, the main characters run inside a room and close the door. Grant claims they are safe as long as the raptors don't learn how to open doors. Cue the doorknob turning. Played with in Close Encounters of the Third Kind, when the aliens arrive at the house, a Scare Chord is playing and the camera focused on the key hole of the front door showing a bright light on the other side. Then the little boy opens the door from the inside but no aliens are showing outside. In the horror movie The Skeleton Key, in the scene where the heroine is roaming around the attic, there is a close-up on a door handle and the doors starts rattling. Plays out both ways in the suspense thriller The Window. The kid hero tries to unlock the apartment door from the inside but fails but the rattling of the door knob alerts his father who approaches the door from the outside. Then the father opens the door which in turn gives the boy a good scare because he was expecting his evil neighbors to show up. Watch it here . 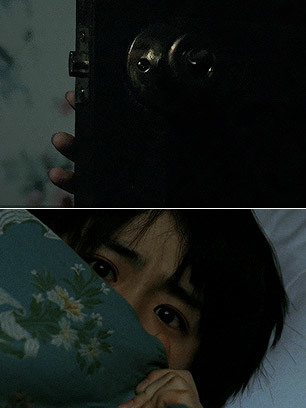 In A Tale of Two Sisters, Su-yeon is terrified in her bed when the door to her sleeping room starts slowly opening with a hand appearing around the door handle. As it turns out this was just a Nightmare Sequence. Watch the scene here . Many film adaptations of A Christmas Carol emphasize Scrooge's door unlocking on its own when Marley visits. Subverted in The Terminator. When the T-800 assaults the police station, Sarah Connor hides in a room under a desk. Then we see a shadow approaching the door, the camera closes up on the door handle getting turned. Then the window gets smashes in. But it's not the T-800 but Reese. In the pilot episode of The Walking Dead, Rick is at the house with Morgan and his boy, hearing the car alarm go off outside on the street. He looks out the peep hole on the front door to see another zombie on the other side. The zombie then looks down towards the door knob, and then Rick, and the camera focuses on the door knob turning to the left and right. Used suspenseful in Stranger Things episode "The Mind Flayer". The heroes are under attack from the demo-dogs and suddenly the door starts opening. Turns out it's Eleven entering. Watch the scene here . Happens in the pilot of The Haunting of Hill House when the upset father comes to his son's room at Hill House and locks the door behind him. Then we get a close-up on the door handle as it turns slowly left and right. In Silent Hills, a door handle suddenly starts to move here . Parodied in The Simpsons episode "Two Dozen and One Greyhounds", where Bart and Lisa sneak into Mr. Burns's mansion to save their little dog puppies. When Mr. Burns tries to enter the room they are hiding in, we first see the door handle as it starts moving downward. Bart and Lisa look terrified. Then there is another shot of the handle as it slowly turns... and turns... and turns... until it has completed a full 360-degree turn. The door opening takes so long, that it gives Bart, Lisa, and the dogs time to escape through the laundry shaft.